Twin wall sectional flue can be used in situations where no structural flue is available. 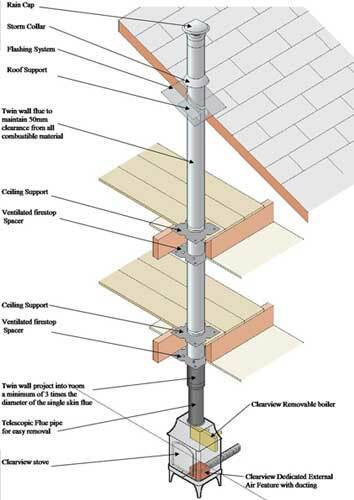 We can create a chimney system through the home or out through an external wall if required. Important safety advice on installation practices should be observed when installing this type of product. It is a requirement that the flue system is kept a minimum of 50mm away from combustibles throughout. This means timber, plasterboard and roof felt. The single skin pipe or vitreous enamel pipe associated with stoves is not permitted to be closer than 3 times it’s diameter from anything combustible. As an example, if the pipe coming off your stove is 150mm (6”) diameter, it is to be a minimum of 450mm (18”) away from combustibles, including ceilings. This being the case, the twin wall flue system should project at least this distance into the room serving the appliance. These distances must be observed during installation at all times. If your flue or stove are deemed to be responsible for a house fire then your insurance company will be looking for reasons not to pay out. One of the most commonly used excuses for not covering damaged properties is non compliance to manufacturers installation instructions, building and fire regulations…and basic common sense. Not only does it stand to reason, but now it is a building control requirement to use a telescopic single skin pipe to make the union between the appliance and twin wall flue adapter. This makes it easier to remove the appliance for maintainance, replacement and repair if it becomes necessary without the need to dismantle the entire chimney system.